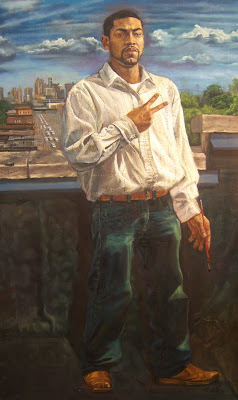 So this is the painting that I was working on the rooftop of the 555 gallery in Detroit. It is finally finished and the title of the piece is "Detroit Lover". Let me know what you all think. Nice painting. Great structure in the shirt. Why did you choose to show a police armada in the distance? I chose the police band because I am constantly harassed by the police no matter how calm or nice I may seem. I feel you bro. Checked out the show at the Cass Cafe this past weekend, truely dope artwork. Man, this is killer! Always a pleasure seeing new work from ya!